Basketball fans all over the world were treated to a great performance in the 2015 NBA Finals as the second game in the series between the top-seeded Golden State Warriors and the Cleveland Cavaliers again went to overtime. Both teams are grinding it out for a gritty performance as we saw for the first time ever two successive games that needed five extra minutes to decide the outcome. Lebron James came out on top this time with another triple double performance with 39 points, 11 assists and 16 rebounds and the Cleveland Cavaliers played physical and made it an even best-of-seven series in Game 2 of the 2015 NBA Finals with a 95-93 OT win. James brought his “A” game to finally give the Cleveland basketball franchise their first ever win in the NBA Finals. Back in 2007, they were swept by the San Antonio Spurs in James’ first Finals experience. The low scoring ballgame has the Warriors playing catch-up most of the way. A run in the fourth quarter by the Warriors enabled the team to tie it up and send the game to overtime. On a night where the 2015 NBA Most Valuable Player, Stephen Curry, struggling to score, the Golden State Warriors stayed in the game and cutting the deficit to five as the game approaches close to the 2 minute mark remaining. One highlight is the opening made by Grammy award winner Carlos Santana, performing the American National Anthem, together with his wife Cindy, to the delight of the Oakland crowd. Only one-half of the “Splash Brothers” was on target tonight. Klay Thompson, led all Warriors in scoring, made his 34th point on a layup to cut the lead to 3 in the last two minutes. 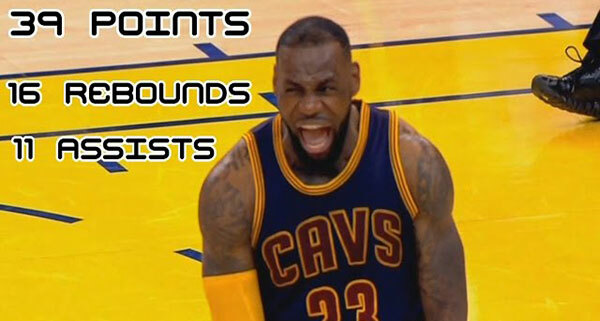 Back to five as Lebron James sinks in two in the charity stripe. Harrison Barnes cut the deficit two on a three point play by Harrison Barnes. Both teams fighting tooth and nail to be able to get the win including a mad scramble at the :38 remaining in regulation as the Cleveland Cavaliers trying to hang on to their lead as the Warriors claw their way back to just two points behind. Game tied at 7.2 seconds remaining courtesy of a layup from Stephen Curry which sent the game into another five minutes of extra time. Iman Shumpert gave the Cavs the first point to break the deadlock in OT. J.R. Smith fouls out of the game on a foul on Stephen Curry which gave the Warriors the lead after two free throws. Dellavadova, who started the game in place of the injured Kyrie Irving, gave the Cavs a one-point lead with 10.1 seconds remaining. Dellavadova defended Curry well on the Warriors attempt to get it tied on their final play. The series now shift to Cleveland, Ohio where the Cavaliers now enjoy home-court advantage after stealing Game 2 from the top seed Warriors. Game Three is on Wednesday at 9 AM (Manila Time).